I like comfort food. Who doesn't? Like everyone, I have my favorites, and near the top of that list (right next to potstickers and bacon) is corned beef hash. 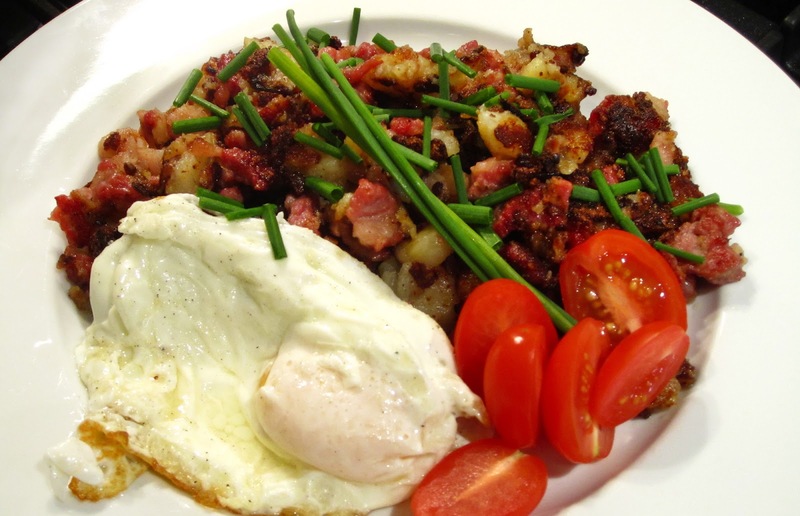 More specifically, homemade corned beef hash. 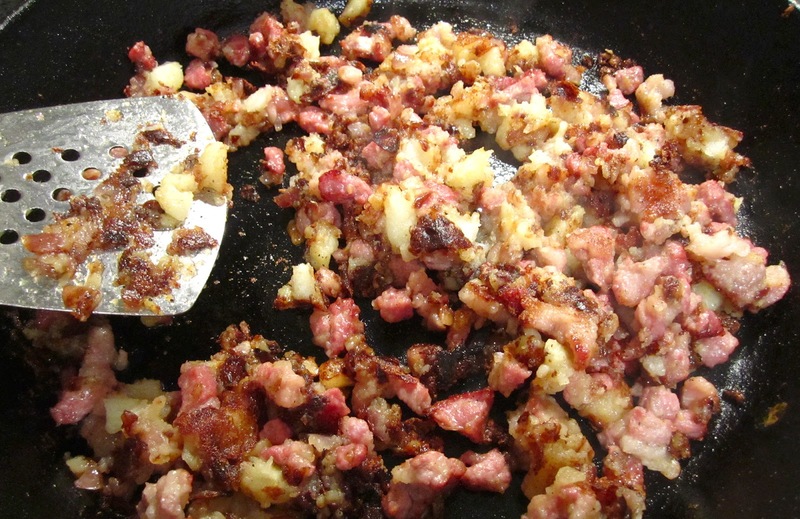 Hash is just so incredibly easy to make and doesn't require a lot of effort - if you've ever done it, you know that it takes more patience than anything else. However, there's a few shortcuts you can take if you're like me and you want it faster. Traditionally, you've got to have an egg with it. I still preferred a good fried egg but lately, soft-boiled eggs are making a comeback. And here I've tossed some fresh chives and tomatoes to offset the richness from the egg and oils. Good eats! The reason for a fatty beef is that it will crisp up much nicer than lean cuts. The meat can be already cooked but for a change of pace, try using uncooked meats (take care with some cuts that have a high water content such as stewing beef - they won't cook the same way). If it is already cooked, put it in late in the process. Bake the potato for 4 minutes in a microwave (not completely). While "baking," rough cut the beef into small pieces - no larger than 3/8" cubes. Holding the potato in a towel, peel the skin off the potato and then chop similarly. Heat the oil in a large skillet (preferably cast iron) over medium-high heat. When hot, put the meat and potatoes in and fry until browned on one side, then toss and continue until there is a nice crispness on most of the ingredients. Salt and pepper to taste. Personally I love hash doused in ketchup, but that's a personal preference. 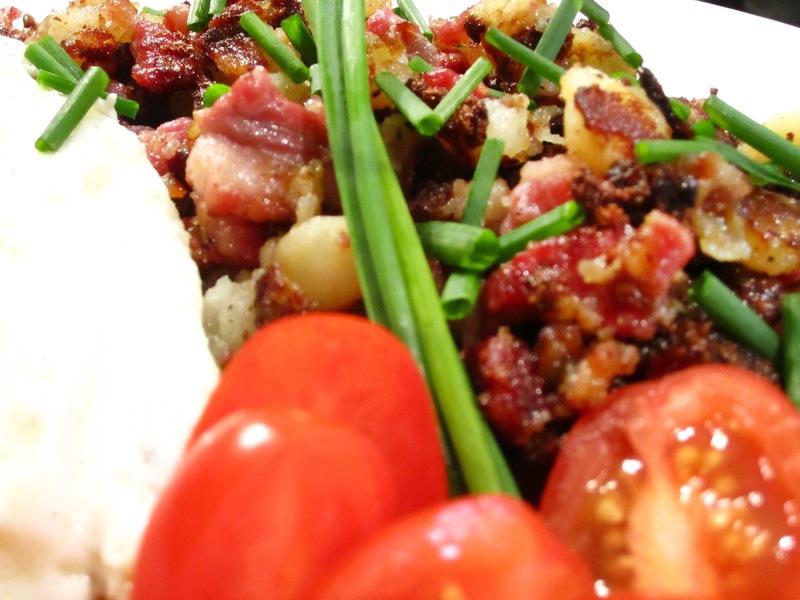 I will have to try making this, my husband likes to eat corned beef. Thanks for the recipe.